Yonge Street is the central corridor within North York Centre, one of four mixed-use and transit accessible centres identified in the Official Plan where jobs, housing, and services will be concentrated. The City of Toronto will evaluate opportunities to improve the streetscape and public realm for all users (pedestrians, cyclists, transit and vehicles) along Yonge Street from Sheppard Avenue to the Finch Hydro Corridor. City Council considered a staff report on the Reimagining Yonge (Sheppard to Finch) Municipal Class Environmental Assessment Study on March 26, 2018 and postponed its consideration to a later date to permit the Toronto Transit Commission Board to consider the long-term implications for surface level buses as well as the overall City/York Region transit planning and report directly to City Council. The study is being carried out under Schedule ‘C’ of the Municipal Class Environmental Assessment (EA), which is an approved planning process under the Ontario Environmental Assessment Act. The public will have opportunities for input at key stages of this study. The study will define the problem, develop and evaluate alternative solutions, review public and stakeholder feedback, and identify measures to minimize any impacts. An Environmental Study Report will be prepared at the end of the process in accordance with the requirements of the Municipal Class EA. Thanks to all who attended the fourth Public Drop-in Event on December 11th, 2017. You can view the notice for more information. If you were unable to attend the event, you can view the display panels. Thanks to all who attended the fourth Public Drop-in Event on October 10th, 2017. Thanks to all who attended the fourth Public Drop-in Event on September 19th, 2017. You can view the notice for more information. Thank you to everyone who attended the July 25, 2016 Public Drop-in Event, held from 11:00am – 2:00pm in Mel Lastman Square, and from 5:00pm – 8:00pm in Memorial Hall. You can view the notice for more information. Thank you to everyone who attended the June 9 & 11, 2016 Design Charrette and collaborated with the project team on identifying a preferred alternative solution and developing design options for Yonge Street. You can view the notice. Thank you to everyone who attended the May 25, 2016 Drop-in Event at Memorial Hall. You can view the notice. Thank you to everyone who attended our Jane’s Walk on Saturday, May 7, 2016. Our group started at Mel Lastman Square and walked along Yonge Street to discuss the history of the area, current conditions, and plans for improvements. Yonge Street is the central transportation corridor and pedestrian promenade within North York Centre. Under the provincial Growth Plan for the Greater Golden Horseshoe, the North York Centre is identified as an urban growth centre. While this area is transforming into a transit-oriented and dynamic mixed-use area, the implementation of the street vision has not been fully achieved or kept pace with this evolution. Today the area is faced with challenges from inconsistent features such as sidewalks, pedestrian crossing and medians to lack of dedicated cycling facilities and concerns over traffic movement. Over the past few years, the City has completed work on Yonge Street related to upgrading the underground services (i.e. watermains). However, the overall surface condition on Yonge Street (ie. pavement, sidewalks) requires significant investment to maintain a state of good repair. This study provides an opportunity to create an attractive and consistent streetscape with design appropriate to the civic goals of the North York Centre that will serve people of all ages as they travel in and around the area for work, school and leisure. 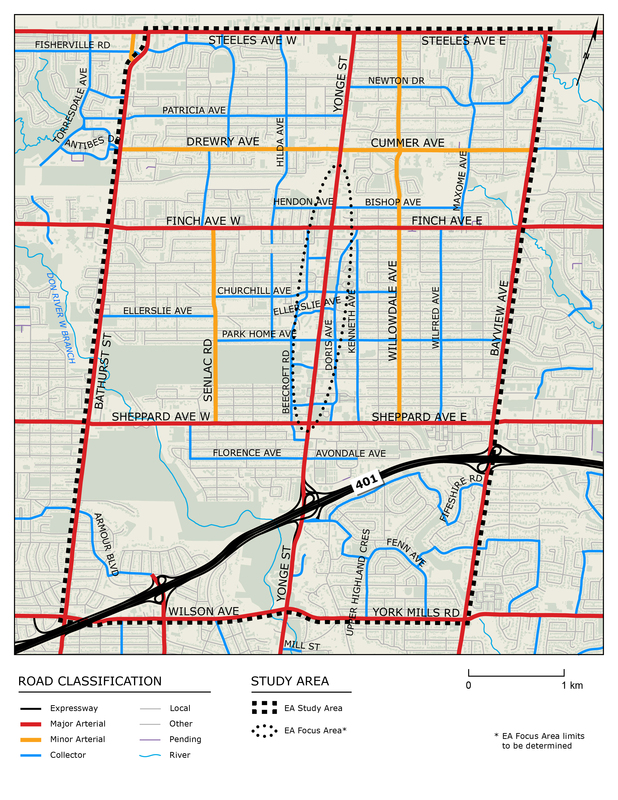 The focussed study area consists of Yonge Street from south of Sheppard Avenue (Avondale Avenue and Florence Avenue) to north of Finch Avenue (the Finch Hydro Corridor), Doris Avenue to the east and Beecroft Road to the west. A larger study area, extending from Bathurst Street to Bayview Avenue, and Wilson Avenue and York Mills Road to Steeles Avenue, is being addressed as well, primarily in terms of potential traffic impacts. This larger study area also defines the consultation area. Why was this study not completed on schedule? In February 2017, City Council directed that further review be undertaken to assess the installation of cycling facilities on Doris Avenue and/or Beecroft Road, rather than on Yonge Street. Beecroft Road and Doris Avenue were created as service roads to provide an alternate route to Yonge Street. Bike lanes were considered previously on these streets, and the City concluded that there was not adequate space for dedicated bike lanes/cycling facilities on these streets. Reconstruction and acquisition of property would be required as well, adding to the cost and complexity. In May 2017, the Public Works and Infrastructure Committee adopted a recommendation to complete an additional phase of design work which includes a comprehensive review of options to implement cycling facilities on Doris Avenue and/or Beecroft Road and Willowdale Avenue from Bishop Avenue to Steeles Avenue. Additional stakeholder consultation will be a key component of this next phase, including consultation with the local business community. Why are dedicated bike lanes/cycling facilities on Beecroft Road and Doris Avenue being studied further? Staff had previously reviewed the feasibility of implementing bicycle lanes on Doris Avenue and Beecroft Road, but had only assessed options that would accommodate painted bicycle lanes within the existing pavement width of these roads, without impacting the number of travel lanes. Accommodating bicycle lanes on both Doris Avenue and/or Beecroft Road could be possible through widening of the existing pavement width, relocation of curbs, and/or the removal of travel lanes. In accordance with direction from City Council in February 2017 and Public Works and Infrastructure Committee in May 2017, a more comprehensive review of options to implement cycling facilities on Doris Avenue and/or Beecroft Road will be completed as part of the next phase of work. Are the preliminary preferred alternative and design options 4A and 4B still being recommended? There are unresolved concerns about certain elements of the preliminary preferred alternative including potential impacts to traffic capacity on Yonge Street and to on-street parking, and the need for wider consultation on the project, particularly with local businesses. The City will be investigating another option on Yonge Street that would meet the project objectives but not reduce the number of lanes on Yonge Street. Additional work will be undertaken to develop this alternative, understand the costs and benefits, and seek public input on it before reporting back to Public Works and Infrastructure Committee and City Council. When is the new phase of work expected to be completed? It is anticipated that a report would be brought forward to the Public Works and Infrastructure Committee in the fourth quarter of 2017 with the outcome of this work. How is the funding being obtained? Funding for capital construction, municipal servicing and utility relocations is currently not available within the 2017-2026 Approved Capital Budget and Plan for Transportation Services. Opportunities to secure funding through the development review process, particularly as it relates to streetscape costs, are being pursued. Funding for this project would be considered against other unfunded City priorities as part of a future capital budget process. The detailed design stage of this work could be advanced through leveraging the $2.0 million of available Public Transit Infrastructure Funds (PTIF) for detailed design beginning in 2017. Why does the northern limit of the study focus area not extend to Steeles Avenue? The northern limit does not extend to Steeles Avenue because of the different character (e.g. lack of subway, less retail, higher volumes of bus traffic, etc…) of Yonge Street north of Finch Avenue. In addition, the area north of Finch is subject to a different Secondary Plan. A separate “Phase 2” study will be undertaken to examine potential changes to the section of Yonge Street from Finch Avenue to Steeles Avenue. It is anticipated that this will be initiated in 2017. What does the Environmental Assessment process involve? The study is being carried out in accordance with the requirements of the Municipal Class Environmental Assessment, which is an approved planning and decision-making process under the Environmental Assessment Act that is used to assess changes to public infrastructure. The process includes identifying the problem or opportunity to be addressed, developing and evaluating a range of alternative solutions, identifying a preliminary preferred solution, evaluating design options for the preferred solution and selecting a preferred design option. The study is being completed as a Schedule ‘C’ undertaking, which generally includes the construction of new facilities and major expansions to existing facilities. The public will have opportunities for input at key stages of the study. Input can be provided to the Project Team at any time throughout the study by phone, mail, fax, email, or by attending one of the consultation events. We have provided multiple opportunities for input. The new phase of work will provide opportunities for public and stakeholder engagement. Kate Nelischer is the City’s Senior Public Consultation Coordinator for the project and can be reached by email at knelischer@toronto.ca or phone 416-392-4360. Will there be another public drop-in event? As indicated above, the City is undertaking a new phase of design work. Two Public Drop-in Events (#4 and #5) are included in this new phase of study. Notices will distributed to all property owners within the study area, posted online on the project webpage, printed in the North York Mirror (East), and sent to the project email list. Construction timing is contingent on availability of funding from Council, receiving the necessary planning approvals/permits and completion of the detail design study. Will there be property impacts? The property impacts associated with the new design alternatives will be considered as part of the additional phase of study. Should property impacts be identified, these impacts will be weighed against the relative advantages and disadvantages of each alternative considered. How will the design options accommodate vehicles, pedestrians, and cyclists? Design options developed include consideration of all modes of transportation. The preferred design option has not been selected, but we welcome your input about different modes of transportation along Yonge Street, Beecroft Road, Doris Avenue and other streets within the Study Focus Area. The City’s public right-of-way extends from adjoining property lines and includes Yonge Street, the sidewalks and public boulevards. Reconfiguring the right-of-way is being considered to accommodate other elements, such as dedicated bike facilities, wider sidewalks and street trees. These changes are consistent with the application of a Complete Streets approach to accommodating all modes of transportation and have the potential to enhance Yonge Street as a better public space. The City is continuing to review alternatives for Yonge Street. Are you considering removing traffic lanes? The preliminary preferred alternative includes a reduction of travel lanes from 6 to 4 between Sheppard Avenue and Hendon Avenue / Bishop Avenue. However, given the unresolved concerns about certain elements of the preliminary preferred alternative, the City is continuing the Environmental Assessment Study to investigate another option on Yonge Street that would meet the project objectives but not reduce the number of lanes on Yonge Street. A transportation simulation model is being completed to assess the existing and future transportation needs along Yonge Street, Beecroft Road and Doris Avenue. Will there be more controlled pedestrian crossing points along Yonge Street? The study is reviewing existing pedestrian crossing locations along Yonge Street, and will review existing pedestrian movements and collision data. The study will consider the feasibility of adding more controlled crossing opportunities along Yonge Street. What is the status of the Yonge Street/Highway 401 study? This study is on hold pending further discussions with MTO. What is the status of the Doris Avenue/South Service Road Extension EA? The City is recommending “Option B” as identified in the North York Centre South Service Road Environmental Assessment Addendum Study. The preferred option includes an extension of Doris Avenue south of Sheppard Avenue East to connect with Tradewind Avenue. The extension would form a single continuous intersection with Sheppard Avenue East and result in the conversion of Bonnington Place, north of Lyndale Drive, to a cul-de-sac. Completion of the Doris Avenue/South Service Road Extension will be informed by the completion of the additional phase of work for the REimagining Yonge study. When will there be a recommended plan? The preliminary preferred alternative was presented at the third Public Open House on September 29, 2016. A recommended plan for the proposed new phase of study will be presented in the fourth quarter of 2017. How may this study affect planned or proposed developments within the study area? Representatives within the City are working together to review the status of active development applications within the study area. The City will meet with local developers to ensure that all planned construction work is coordinated to the extent possible. What does the “public realm/streetscape” mean? Public realm is defined as any publicly owned streets, pathways, right of ways, parks, publicly accessible open spaces and any public and civic building and facilities. Enhancing the public realm is a key aspect of the project. Hasn’t the City recently completed construction on Yonge Street? The work completed over the past few years has been related to upgrading the underground services (i.e. watermains) and maintaining the overall state of good repair. Despite this work, Yonge Street continues to be faced with challenges from inconsistent features such as sidewalks, pedestrian crossings and medians to lack of dedicated cycling facilities and concerns over traffic movement. The City is looking at ways to create an attractive and consistent streetscape with design appropriate to the civic goals of the North York Centre that will serve people of all ages as they travel in and around the area for work, school and leisure. A full reconstruction of the street is expected to be required in the next few years and this project takes advantage of an opportunity to enhance the road and public realm at the same time the road is reconstructed. Will there be underground utility work? Reconstruction of the road will result in the relocation of some underground utilities, while others may need to be adjusted slightly. As part of the City’s study, the Project Team is meeting with utility companies and local developers to ensure that any utility work is coordinated. The City has undertaken a subsurface utility engineering investigation on Yonge Street from Florence Ave./Avondale Ave. to the Finch Hydro Corridor to confirm the existing underground infrastructure (ie. watermains and sewers). Additional subsurface utility engineering investigations will be completed as part of the next phase of study. Is the City planning to connect the bike trail within the Finch Hydro Corridor to Yonge Street? Yes, the City is planning to connect the trail along the Hydro Corridor to Yonge Street. Discussions with TTC and others are ongoing. Will the City be committed to maintain changes to Yonge Street? Once reconstruction of the road has been completed, the City will be committed to maintaining it. One of the criteria used to evaluate the design options is maintenance/operational costs and this will be carefully considered as part of the recommended plan that is presented to City Council. The project team consists of City staff who will ultimately be responsible for maintaining Yonge Street and have a strong understanding of the maintenance/operational costs associated with each of the design options. In addition, the City is meeting with utility companies and local developers to ensure that any planned subsurface work is coordinated with this project. Will the budget estimate affect the construction schedule or decision-making? Cost is one of many criteria that will be used to evaluate the design options. However, it will not be the deciding factor as other criteria will also be used to evaluate the design options (ie. impacts on cycling and walking, accessibility, natural environment, etc.). The construction schedule will be determined during the detailed design phase and as such, the budget estimate will be refined at that time. Will the project affect the tax rate for the adjacent residents and businesses? Funding for this project will be requested through the City’s capital budget process. A specific tax levy for this project is not contemplated.